Did you see the headlines proclaiming McDonald’s is dropping soda from Happy Meals? It made quite a splash generating great PR for the fast food giant, but it turns out the devil is in the details. Having read Michele Simon’s book Appetite for Profit, I knew to look past the headlines. She details numerous examples of how McDonald’s “promises don’t last longer than the time it takes the ink to dry on a corporate press release.” Her top recommendation? “Always look at what exactly the company is promising to do.” When I looked for the details on this one, I found McDonald’s CGI Commitment. In the fine print, it was pretty clear that McDonald’s was not promising to drop soda from Happy Meals. McDonald’s may list soft drinks as offering on Happy Meal section of menu boards. This was not too surprising since they bill Coke as “your McDonald’s Meal’s BFF.” The Center for Science in the Public Interest called out this Happy Meal deception. Small print aside, McDonald’s commitment to the public, as expressed clearly in its ads and press release, is to not promote soft drinks with Happy Meals or feature them on menu boards. CSPI will be monitoring McDonald’s practices and will consider suing the company if it mentions soft drinks in the Happy Meal section of menu boards or any other type of marketing, or if servers offer soft drinks as an option with the meals. We hope that McDonald’s keeps its commitment, as it did not do in 2003 when it said that it would stop frying its foods in oil containing trans fat. In fact, it took a lawsuit to get McDonald’s to eventually keep that commitment. The press release also highlighted the choice of a side salad, fruit or vegetable as a substitute for french fries when ordering value meals. I am a big proponent of increasing access to healthy choices, but know it has limited impact when it comes to fast food customers. The fast food executives know this too. Burger King’s market research, for example, showed that people who walk into a restaurant intending to order grilled chicken change their minds at the register and consistently order fried. The key for fast food companies is getting people in the door. One of their most effective tools for doing that is advertising. McDonald’s annual advertising budget has been estimated to exceed $2 billion. A significant portion of that is directed at marketing to children. Author Anna Lappé recently released a film detailing the harmful effects of food marketing to children. She answers some important questions about food marketing to children. Food companies tell us they’re just doing their job: serving up exactly what children and teens are asking for. But are these foods really what kids want? Or are they what corporations are pushing on our kids? And who is being too controlling when it comes to Moms like me who insist on carrots instead of Cheetos, or food corporations who spend roughly two billion dollars a year on ads specifically targeting children and teens—ads telling kids what’s cool to eat. Foods that are cheap for companies to make, easy to brand, and designed to be addictive—all ingredients for huge profits. She also included examples of what can be done to protect children. We can stand with the parents, teachers, mayors, doctors, all across the country who have won real victories in this fight: like the school administrators in St. Paul, Minnesota who banned school-based marketing of junk food and sugary drinks. Or the grocery chain owner in Maryland who decided to take kids’ products that feature cartoon characters off his shelves. Or the people of Quebec who passed a ban on fast food advertising to kids—and saw a thirteen percent decrease in fast food consumption. We can work together to scale up these wins—and more like them. Instead of limiting marketing to children, the agreement with the Alliance for a Healthier Generation outlines numerous ways McDonald’s will continue marketing to them. For those of us working hard to get McDonald’s marketing out of schools, kids’ fitness events and all the other places they attempt to get around the parental gatekeeper, our job just got more difficult. When AHG partners with McDonald’s, it increases the likelihood that others will too. It’s made it even tougher to discourage organizations like school PTAs from promoting McTeacher Nights. Instead of calling on McDonald’s to stop marketing to children, AHG’s partnership acts as an implied endorsement which reflects poorly on the organization and those of us who represent it. If the Alliance truly wants a healthier generation, it should join the call for McDonald’s to stop marketing to children. Public health didn’t use the “global marketing power” of Joe Camel in order to reduce the rates of youth smoking. 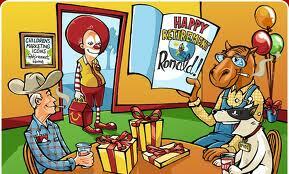 It’s time to retire Ronald, shutdown HappyMeal.com and stop marketing McDonald’s to children. Tags: Alliance for a Healthier Generation, Anna Lappe, CSPI, mcdonald's, Retire Ronald. Bookmark the permalink. Good reporting. Thanks for pointing folks in the right direction.